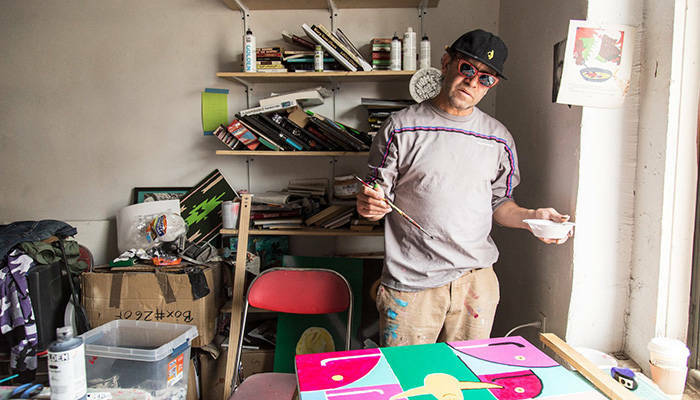 Mark Gonzales walks to the beat of his own drum. This is very apparent in his skateboarding. His approach is different, and oozes creativity. When Mark gives an interview, his answers are typically unexpected as well. He has a highly creative mind—which, by and large, is one of the keys to becoming a great skateboarder. GQ recently sat down with the Gonz and talked about a variety of topics that are rarely touched on—including why Mark has not had a smartphone in five years. You don’t have a phone or any social media, what does that do for you? I don’t know… I think it’s been a solid year maybe and I don’t even recognize it. Five years? Wow, that’s a long time. I didn’t realize it’s been that long. My eyes are open. I’m listening and watching people all the time. I’m more in touch with the pulse of the city and the people rather than being on social media. You see some people pick their heads up from their phones and you can read their facial expressions and you can monitor what they were looking at, or at least in your own mind you can imagine what kind of message was coming through the phone. For more on Mark, head over to GQ and read the interview in its entirety.